Russian chemist Dmitri I. Mendeleev (1834–1907) has formulated the periodic system of chemical elements (PSCE) in 1869. Frequently, this is considered as one of the greatest inventions in chemistry. The year 2019 marks the 150th anniversary of this discovery and has thus been proclaimed the “International Year of the Periodic Table of Chemical Elements (IYPT2019)” by the United Nations General Assembly and UNESCO. Philately is my hobby and in the last years I have focused especially on chemical items. From time to time I prepare short articles for newspapers or journals on various topics and support them with philatelic materials (1-4). I have recently prepared a short contribution about the periodic table, Mendeleev and also about some lastly discovered chemical elements for Slovenian journal »Kemija v šoli in družbi« (Chemistry in school and society) (5). Therein I have involved selected philatelic items that are related to periodic table and some I present also below. I am sure that this year some new stamps, first day covers (FDC), seals, etc., will appear to celebrate IYPT 2019. 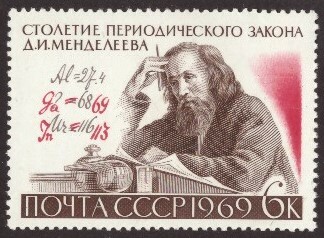 It is understandable that most of stamps that show Mendeleev were issued in Russia (and previously in Soviet Union). 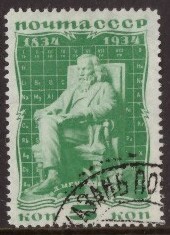 To the best of my knowledge, the first stamps showing Mendeleev were issued in 1934 (100 years after his birth). Fig. 1 shows one of these. The stamp issued to commemorate 100 years of periodic table of chemical elements discovery (1969) shows Mendeleev deep in thought (Fig. 2). Two chemical elements that represented some problems to Mendeleev are marked in red. Gallium was then not yet discovered but he has predicted its existence. It was discovered by French chemist Paul Emile Lecoq de Boisbaudran in 1875. In contrast, indium was already known but its relative atomic mass was not determined accurately. Non-accurately determined relative atomic masses were the reason that in the first versions of the periodic table some elements were placed in wrong positions which was later corrected in improved versions. Interestingly, also the available relative atomic mass of ruthenium, the most important element for our research group was not very precise at that time (104.4; correct value is 101.1). A commemorative postcard (Fig. 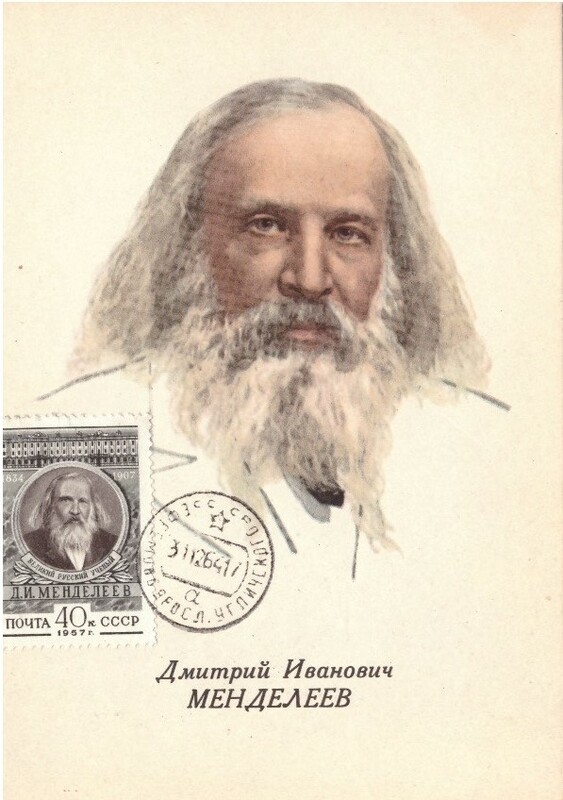 3) showing the portrait of Mendeleev with a stamp and corresponding seal were issued in 1957 (50 years after his death). 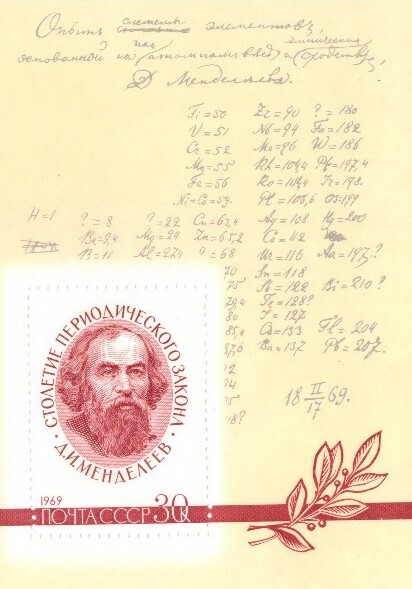 A souvenir sheet from 1969 (100 years of PSCE discovery) shows the stamp with Mendeleev which is embedded in his signed and dated work paper (Fig. 4). 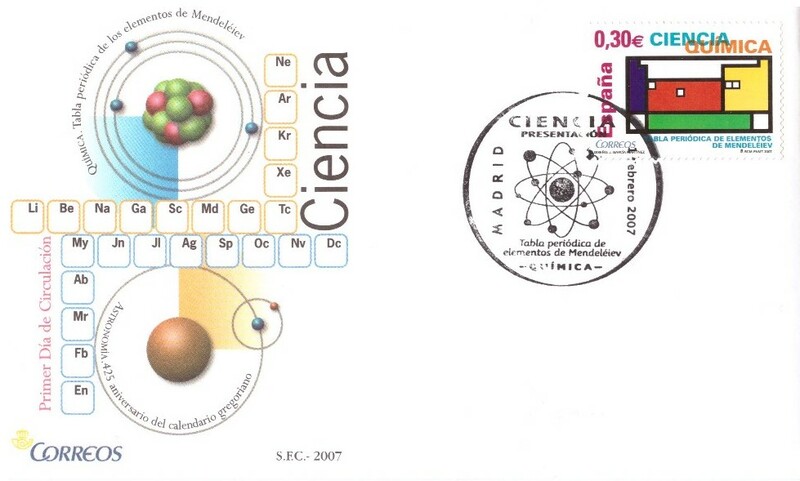 Spanish post has issued the first day cover in 2007 (hundred years after Mendeleev died) (Fig. 5). The corresponding stamp shows a colourful drawing of the periodic table which was inspired by the paintings of Piet Mondrian, the Dutch painter. Four smaller white squares in the periodic table represent elements that were predicted by Mendeleev (scandium, technetium, gallium, and germanium). First day cover from Armenia shows Yuri Oganessian who is one of the leading nuclear physicists in the field of superheavy chemical elements (Fig. 6). He was involved in the preparation of several elements, among them is also the currently heaviest which is named oganesson (Og) in his honour. 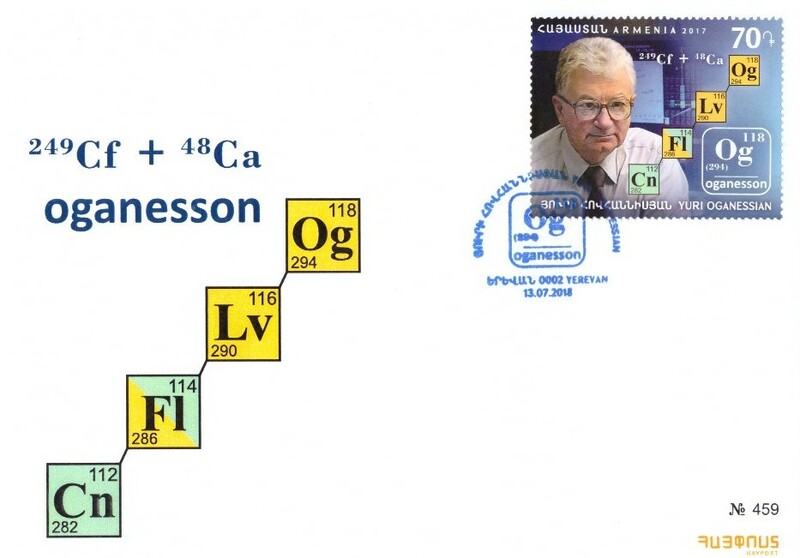 Artificial heavy elements are very unstable and the radioactive decay pathway of the isotope oganesson-294 is also shown on the stamp and cover. With the isolation of this element the 7th row of periodic table was completed (Z = 118). 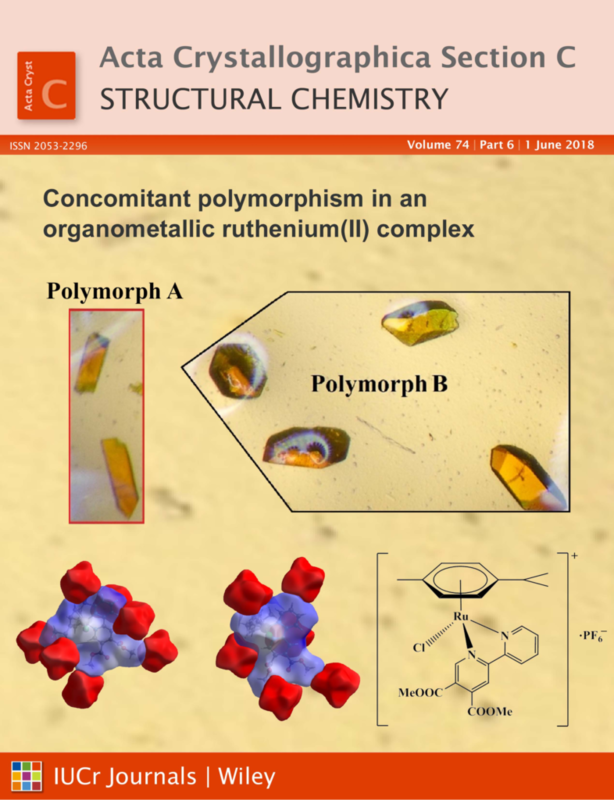 The methods of how to “synthesize” new chemical elements, how to verify and name them, as well as some speculations about possible new element discoveries in the coming years were nicely presented in the paper of Prof. J. Reedijk recently (5). I. Turel, Acta Chim. Slov., 59, p. S94-S96 (2012). I. Turel, Acta Chim. Slov., 60, S115-118 (2013). D. Rabinovich, I. Turel, Philatelia chimica et physica, 35, 171-173 (2014). I. Turel, Kemija v šoli in družbi, nr. 1, p. 1-4 (2019). J. Reedijk, Row 7 of the periodic table complete: Can we expect more new elements; and if so, when?, Polyhedron, 2018, vol. 141, str. 1–4. 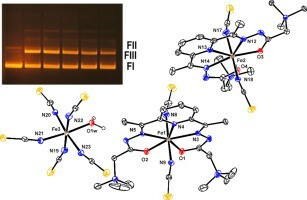 In this paper , a library of 17 organoruthenium compounds was screened for inhibitory activity against cholinesterases and glutathione-S-transferases of human and animal origins. 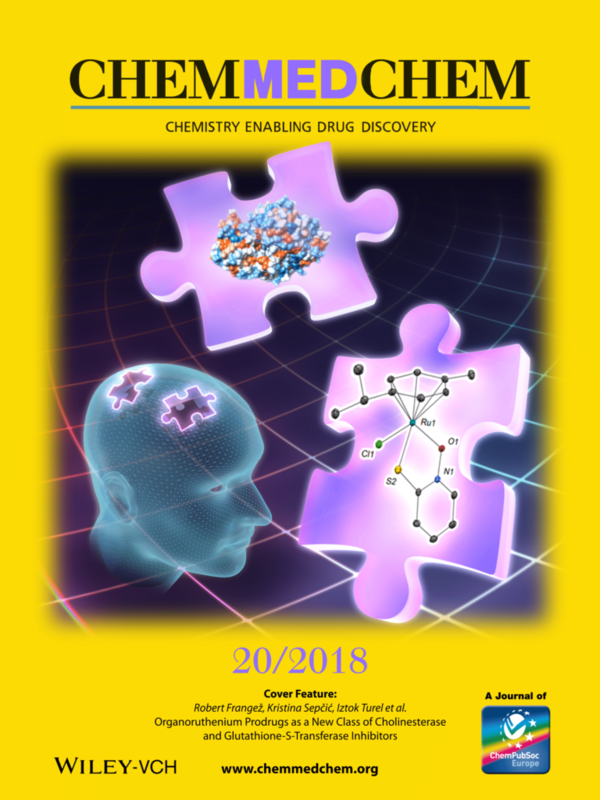 The cover feature picture (see below) shows an organoruthenium-pyrithione complex which inhibits cholinesterases and glutathione-S-transferases at pharmaceutically relevant concentrations while we observed no undesirable physiological responses on the neuromuscular system as well as no toxicity against non-transformed cells. Combining these results with our previous study (Kljun et al. Dalton Trans. 2016, 45, 11791-11800) which has shown the ability of this compound to inhibit enzymes involved in hormone-dependant breast cancer as well as high toxicity on MCF-7 breast cancer cell line it is supposed that the cover page compound can be an interesting candidate as a multi-target drug for the treatment of cancer or Alzheimer’s disease. 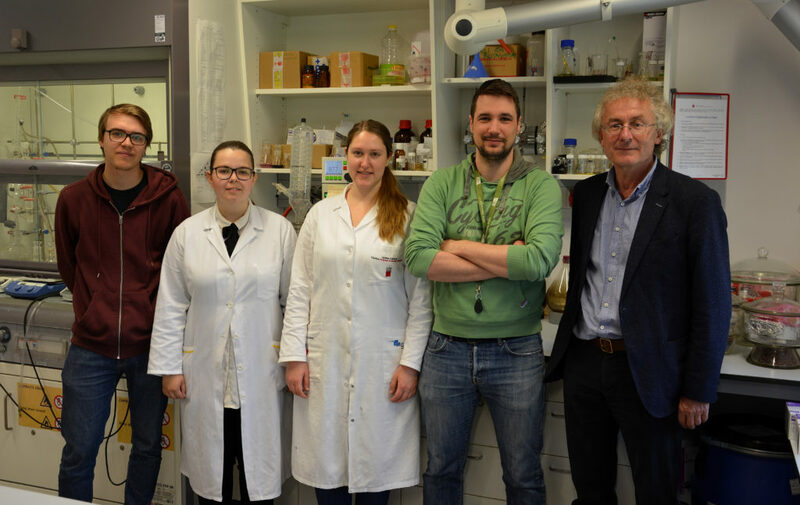 In this multidisciplinary study we have joined the forces with our colleagues from different faculties of the University of Ljubljana (Biotechnical Faculty, Faculty of Medicine, Veterinary Faculty) and a student from University of Rijeka was also involved. S. Ristovski, M. Uzelac, J. Kljun, T. Lipec, M. Uršič, Š. Zemljič Jokhadar, M. C. Žužek, T. Trobec, R. Frangež, K. Sepcic, I. Turel, Organoruthenium prodrugs as a new class of cholinesterase and glutathione-S-transferase inhibitors, ChemMedChem, 13, 2166-2176 (2018). In mid March Prof. I. Turel was invited to act as external reviewer of Ph.D. thesis and Viva Voce examiner at Royal College of Surgeons in Ireland (RCSI). In this thesis D. Keogan has studied metallohydroxamates as novel anti-bacterial and anti-leishmanial agents under supervision of Dr. D. Griffith (Department of Pharmaceutical & Medicinal Chemistry). It was a very nice experience and also a possibility to compare Ph.D. procedures at various institutions. Prof. Turel has up to now acted as external reviewer at academic institutions in Slovenia and abroad: Spain (University of Granada); Serbia (University of Belgrade); Italy (University of Cagliari) and Canada (University of British Columbia, Vancouver). 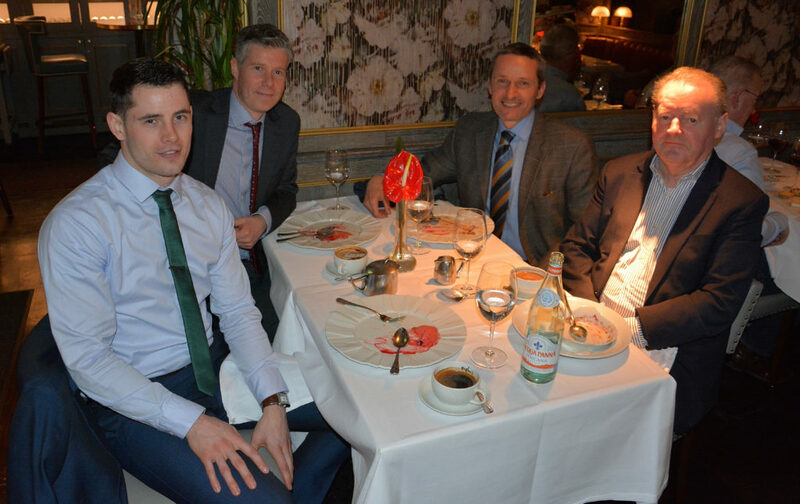 Photo shows: D. Keogan, D. Griffith, Prof. I. Turel and Prof. Emeritus K. Nolan (from left to right) at lunch after examination. 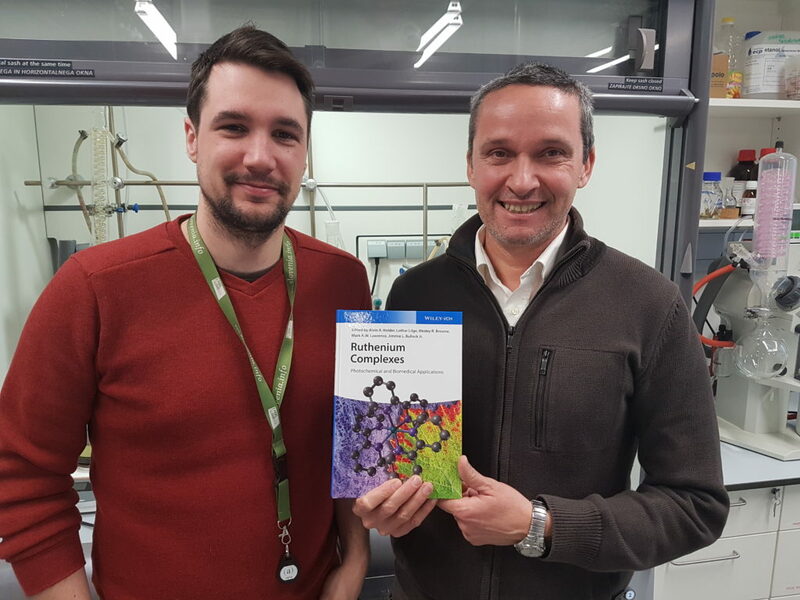 A book entitled »Ruthenium Complexes: Photochemical and Biomedical Applications« (ISBN: 978-3-527-33957-0) was recently published by Wiley-VCH (Weinheim). The book consists of 15 chapters (344 pages). The content of book is covering many interesting properties of this popular element and spans from coordination chemisty of ruthenium to photochemical and photophysical properties of its compounds. The book mainly covers the application of ruthenium complexes in medicine (anticancer and other potential ruthenium drugs; photodynamic therapy; binding to DNA; diagnostics; etc.). Few chapters are also dedicated to applications of ruthenium complexes in artifical photosynthesis, production of hydrogen and oxidation of water. One of the chapters (»Biological Activity of Ruthenium Complexes With Quinoline Antibacterial and Antimalarial Drugs«) was written by senior group members assist. 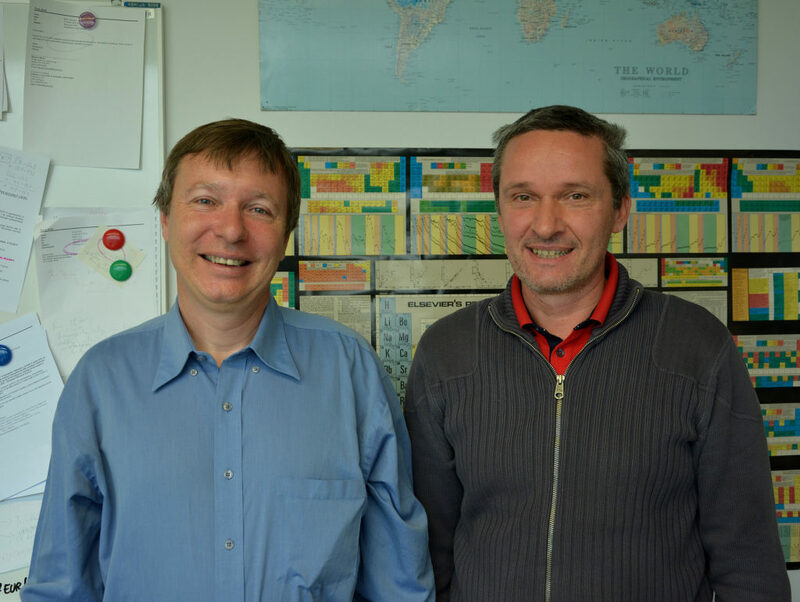 prof. Jakob Kljun and prof. Iztok Turel. More information about the book is available at the webpage of the Publisher . 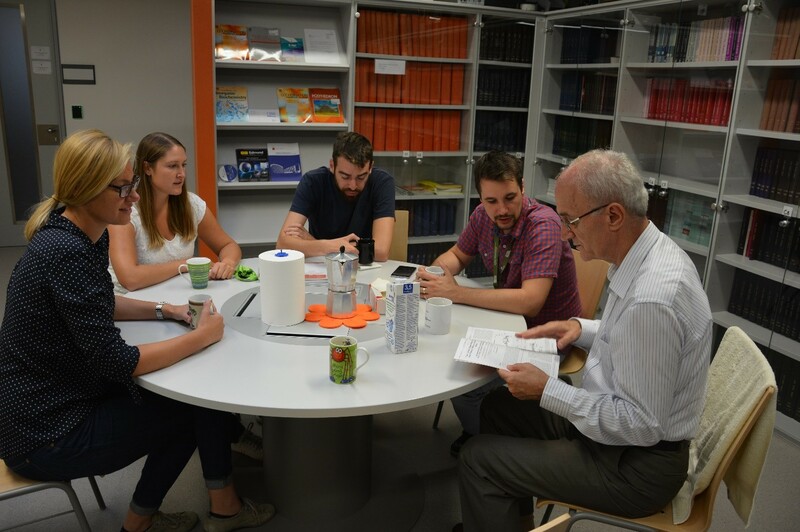 Professor Lee Cronin from the University of Glasgow, UK has visited our labs in May and held a lecture ‘Towards a general theory of chemical evolution’ for the students of the FKKT doctoral study programme. The national newspaper Delo has at this occasion published an interview with prof. Cronin. You can read it (in Slovenian) here. 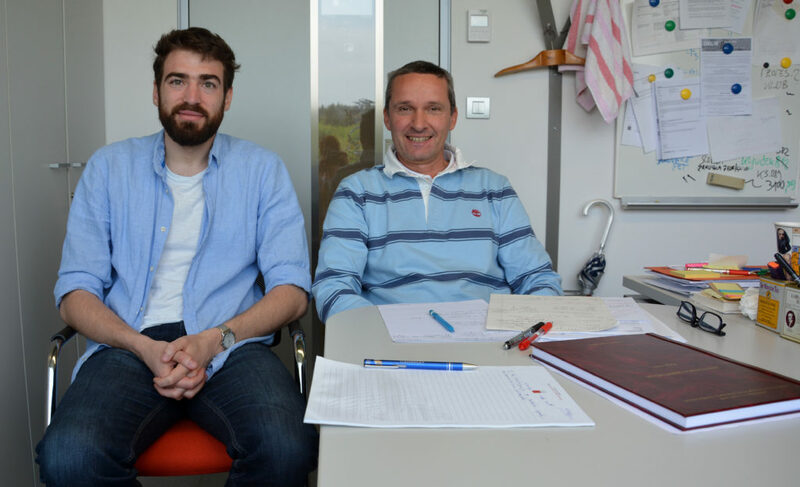 During his one-year postdoc in our labs Božidar Čobeljić introduced Schiff base ligands to our research group. Fruitful cooperation with Belgrade group in last years results in several recent papers which focus on the systemic synthesis and studies of heterocyclic Schiff base ligands of Girard’s reagents and their 3d metal complexes. Further papers are in preparation. Journal of Inorganic Biochemistry (IF 2016 = 3.348): Synthesis, characterization and crystal structures of two pentagonal-bipyramidal Fe(III) complexes with dihydrazone of 2,6-diacetylpyridine and Girard’s T reagent. Anticancer properties of various metal complexes of the same ligand. 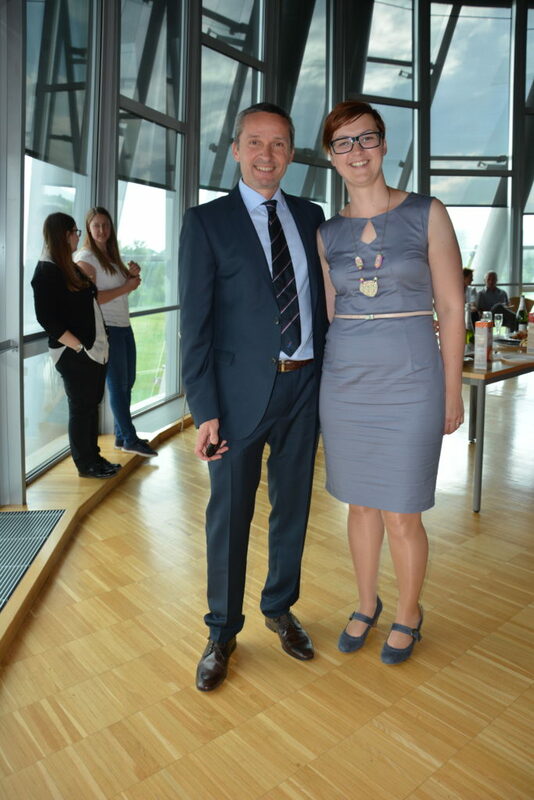 Congratulations to Božidar for the great publications and a big ‘’thank you’’ to all other co-authors for all the hard work. 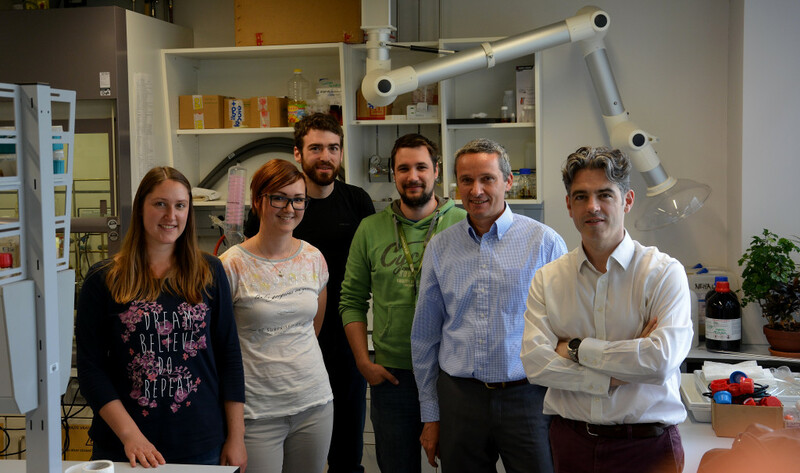 Within the bilateral Slovenian-Serbian project our lab welcomed a visit from member of the Serbian Academy of Sciences and Arts prof. Miloš Djuran and former postdoc dr. Marija Živković. The meeting was instrumental in working out the final details of the manuscript revision of our upcoming article (stay tuned for news!). 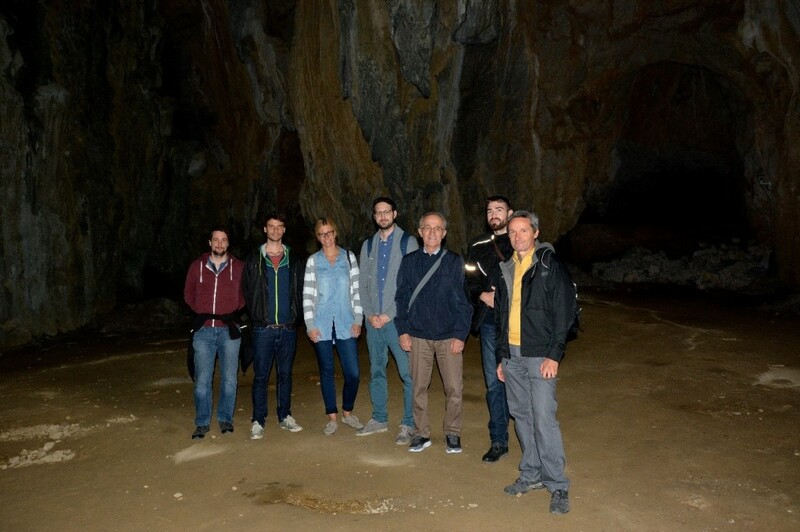 Prof. Djuran also had a lively discussion with the junior team members which was followed by an excursion to the Caves of Škocjan and a work lunch discussing future collaborations.